The successor to this mod, 'Vies Machines' is now available for download! 'Vies Machines' and 'ViesCraft' are independent mods and will work together, but 'Vies Machines' will get all future updates. 1.12.2 - v5.9.13 uses Forge 2655+ : JAVA 8. <-- Anything above v5.9.0 is like a fresh install! 1.12.0 - v5.0.6 uses Forge 2387+ : JAVA 8. 1.11.2 - v5.0.10 uses Forge 2228+ : JAVA 8. 1.11.0 - v4.8.2 uses Forge 2189+ : JAVA 8. 1.10.X - v5.5.1 uses Forge 2185+ : JAVA 8. 1.9.4 - v4.8.2 uses Forge 1976+ : JAVA 8. ViesCraft - Airships is an easy to use mod that brings something new to Minecraft, the ability to create highly customizable airships! All airships can be upgraded, consume fuel to fly, and have an expansion module system which can enhance any airship to fit your needs! Fly your faction's colors, enhance your airship, change your airship's appearance, and just explore your world in style. Sky's the limit! - Airship balloon pronunciations: Viesdenburg [Vise-den-berg], Viesigible [Vie-sij-ible], Viesepelin [ Vie-sep-lyn], Viesakron [ Vise-ah-cron]. 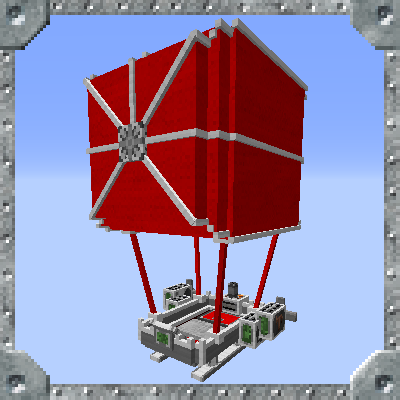 - Use any vanilla fuel source to power any airship except for buckets of lava (by design). These items will burn for their vanilla burn times. - The GUI for an airship can only be accessed by the steering player while mounted in the airship. - When an airship runs out of fuel, it will not be able to elevate. All motion controls becomes stiffer and slower as well as it gradually descends. Pro Tip: Don't be over water or lava! Feel free to use this mod in any modpacks you want. I only ask that you please use the Curse/Curseforge download and do not rehost the files. Thanks! The successor to this mod, 'Vies Machines' will be getting all future updates! The Air Ship is awesome! I made a YouTube video on it (ad free). I hope you like it. That is epic! Very sweet! To go down, you can just press "X" or re-keybind it to anything you want in the controls settings. The curse client let's this load in 1.10, but when the client starts it says that your mod wants only 1.10.2 and not 1.10. I think the problem comes from it being tagged for 1.10 when you have actually compiled it against 1.10.2 and didn't tag it as such. Yeah, Yesterday I didn't have the option for 1.10.2 so I had to make due. It is fixed in the update that I just posted. Thanks! I am curious how the implementation of this mod differs from the archimedes ships mod. (which I believe is on 1.8.9) by the pic it looks like modified boat code? The Archimedes' Ships mod allows you to basically build your airship our of blocks and move that mass around. That can be pretty demanding on a server/PC. 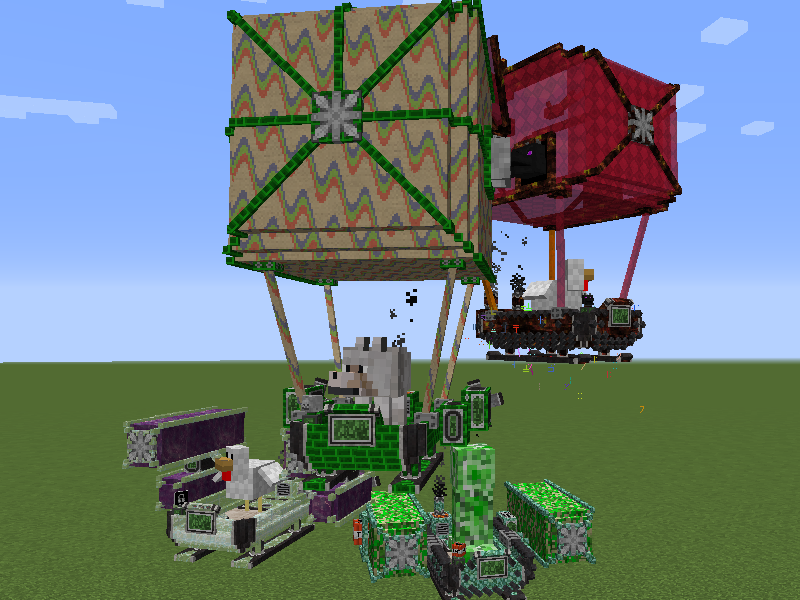 My mod creates an entity that I use for my airship, like a Minecart. In doing this, I can potentially do a lot more with it later down the road without having to think about how resource intensive it is in a server environment. For example, I made the airships hate water. If you submerge it enough, it will begin to smoke and if you do not get it out, it will explode. I also made it so animals can ride in them too, then a player can also get in after the animal and fly them around (I hate luring animals to my base with leads that seem to break easily).